Ash Taylor is struggling with a quad injury. 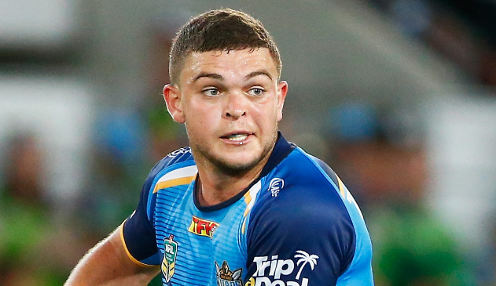 Coach Garth Brennan is set to turn to Ryley Jacks for Gold Coast's round two clash with the Sharks as they have suffered injuries to two halves. The former Storm half is expected to get his chance against the 2016 premiers on Saturday following the Titans' season-opening 21-0 loss at home to Canberra. A quad injury forced halfback Ash Taylor to withdraw from the side prior to kick-off at Cbus Super Stadium and, inside 13 minutes, five-eight Tyrone Roberts suffered an Achilles injury that is expected to keep him out for at least a month. "Ryley will definitely come into the equation if Ash and Tyrone are no good next week, that's for sure," said Brennan. "He's a good player Ryley, that's why we signed him - he's been in a really good system. "I watched him play today and I thought he did a decent job there at Tweed [Heads] and he played well last week as well. On the bright side, this year we do have a bit of depth there in that position; I've got the utmost faith in Ryley and, if he gets the call next weekend, he'll do the job." Taylor had been injured during midweek while completing some kicking practice. The star No.7 will have scans to determine the full extent of his quad injury. Brennan admitted his team had been "rudderless" in the absence of the playmakers and was critical of the ill-discipline that led to them finishing on the wrong end of an 11-6 penalty count. "We made way too many errors and put ourselves under way too much pressure," added the coach. "We were lost, to be honest, losing Tyrone so early; penalties hurt us, discipline was poor and we need to be better than that." Gold Coast are 100/1 to win the grand final this season and 11/5 to win their next game against Cronulla, who are 19/50 to come out on top.